These slow cooker country-style pork ribs are cooked to perfection with a delicious homemade sauce. Garlic, onions, and some basic seasonings add flavor to the tender, juicy pork. I added a tablespoon of Texas Pete to the homemade barbecue sauce but feel free to use another brand of hot sauce or add some cayenne pepper or crushed red pepper flakes for heat. The dish can be made with bone-in or boneless country-style ribs. Browning the ribs adds to the flavor and color, but you can skip that step if you're pressed for time. Trim excess fat from the pork ribs. In a large skillet over medium heat, brown the ribs in the vegetable oil. 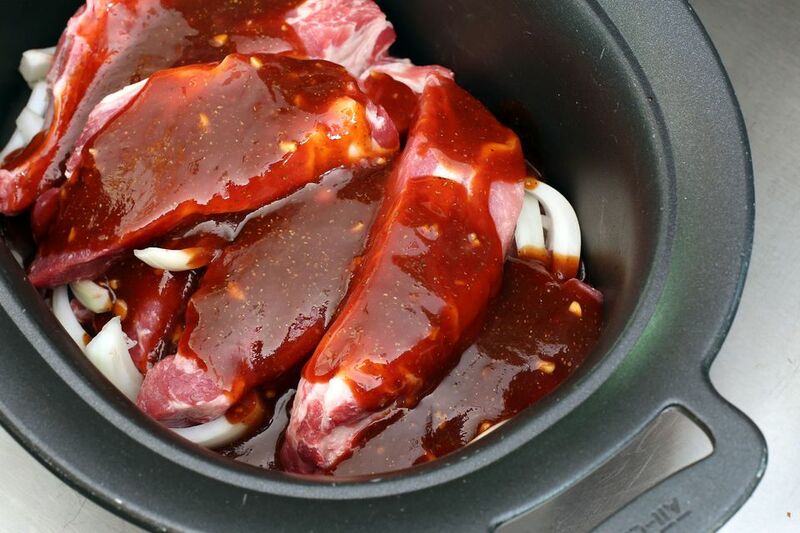 Place onion slices in the slow cooker and arrange the seared country-style ribs over the onions. Combine all of the remaining sauce ingredients in a small bowl; pour over ribs and onions. Cover and cook on low for 7 to 9 hours or on high for about 4 to 5 hours.